Your Event Solution Blog: Event Design Inspiration: What Unusual Things Inspire You? Event Design Inspiration: What Unusual Things Inspire You? 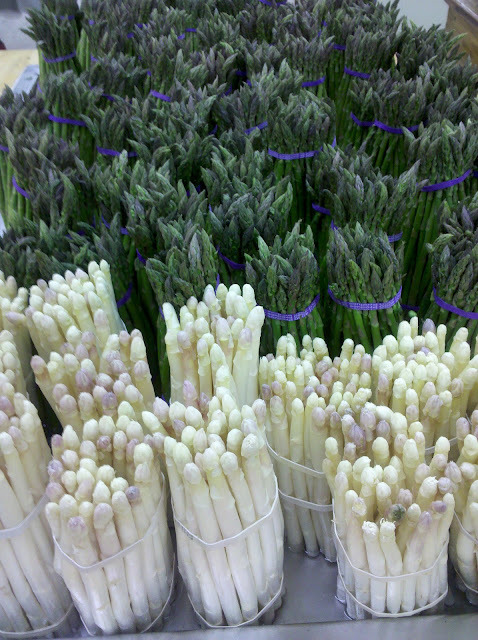 A few days ago one of our team member's visited the local farmers market to grab a few things for dinner. Not only did she leave with ingredients for a tasty meal, but also inspiration for future event design projects. This is testament of how inspiration can stream from anywhere! When we meet with our clients to discuss their ideas for their special events, sources of inspiration are always revealed. Everything from a quilt dressed on the bed of a bride's best friend to a party scene from a client's favorite movie, has served as a source of inspiration for past events that YES has designed. In this case, a few unusual fruit and vegetables aroused our creative appetite. We love the clean, natural look that the green and white asparagus embody here. Pops of color, represented by the purple toned rubber bands, completes the color palette. Bold colors paired with contrasting hues is a common design concept featured at many events today. Two bold colors paired together such as the electric green and crimson red shades we find here in this bundle of Swiss chard, is a perfect combination for any event! These rambutans also represent the pairing of bold colors that work well together. Not only is this fruit's color appealing to the eye, but it's texture is what really grabs your attention. When creating an event's design, it's imperative to remember other visual elements such as texture and space that brings the motif together. What unusual things have inspired you when planning your event? Share with us below and visit our Facebook page to submit pictures of your inspirational piece and the event created from it! In addition to while doing so will probably abate this hazardous variety of h2o and louis vuitton replica handbags produced by cheap squanders which might be polluting your setting. These include definitely not ones everyday, unappealing reusable store looking carriers. Most of these reusable carriers discharge feelings connected with perk because of their shiny wonderful colorings. replica chanel wallet Impressive wetsuits possesses all of their wonderful benefits as well as lumbar seamless pattern, additional critical jean pocket in addition to user-friendly incomplete calf spaces doing this impressive wetsuit a completely performance section of log onto tools. On the Claw whole towards replica louis vuitton vest, this line sustains remarkable doing you hair, healthy in addition to indefinite mobility with just about every gucci replica handbags having chanel FluidFlex, O’Neill’s special gucci replica handbags neoprene.